Bangladesh 2-103 (Mominul Haque 77, Marshall Ayub 21, Trent Boult 1-5) trails New Zealand 469 (Kane Williamson 114, BJ Watling 103, Peter Fulton 73, Abdur Razzak 3-147, Sohag Gazi 2-79) by 366 runs. The Black Caps hammered 469 after utilising 157.1 overs in their first innings and the Bengal Tigers responded with 103 for the loss of two wickets in 26 overs. The second day’s play came to an end on Thursday, October 10, 2013, at Zahur Ahmed Chowdhury Stadium, Chittagong. Earlier, the visitors commenced the day at 5-280 in 89.5 overs while Bruce Martin had yet to open his account. Corey J Anderson got in with Martin but both of them went back to the dressing room after scoring one run each. The Kiwis lost their seventh wicket with the addition of just two runs to the overnight score when BJ Watling along with Doug Bracewell got together in the center. They hit 4 fours as the score went past the 300 runs mark and the latter hit the first six of the day in the 103rd over. The duo was unable to hit any boundary in eight overs and crept to 339 in 112.6 overs when Bracewell was clean bowled by Sohag Gazi for 29. 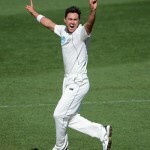 The Black Caps were 9-342 as Trent Boult joined in with Watling who kept on securing his end while adding few runs. The latter reached his fifty on the second delivery of the 126th over and lunch was taken at 9-378 after 129th one. 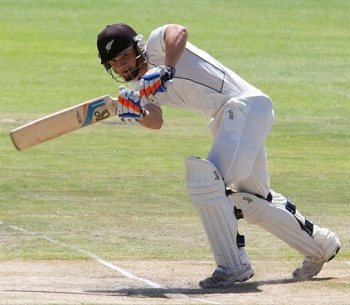 The run rate was picked up by the two batsmen and Boult gathered 11 runs in the 141st over with 1 six and 1 four. The pair hit one six each five overs later as Trent Boult attained his maiden Test half century in the process. BJ Watling kept on cruising and thrashed his second Test century with another six in the 155th over. The last wicket produced a commendable stand of 127 runs and was dislodged at 469 in 157.1 overs. Watling was stumped by the Bangladeshi skipper, Mushfiqur Rahim off Mominul Haque for 103 from 182 balls with 2 sixes and 6 fours whereas Trent Boult was at the other end at 52. Abdur Razzak was the top wicket taker with three, Sohag Gazi and Shakib Al Hasan held two each whereas Rubel Hossain, Nasir Hossain and Mominul Haque shared one wicket each. Bangladesh faced an early blow by losing their both openers for 8 mere runs in 3.3 overs. Tamim Iqbal was caught by Kane Williamson off Trent Boult for a duck and Anamul Haque was declared leg before wicket off Bracewell for three runs. Mominul Haque and Marshall Ayub associated at the crease when their side was in a mess. The first opted to attack and hit three back to back fours in the seventh over followed by another three boundaries in the next one. Mominul Haque continued with his aggression and punched his third Test fifty with another four on the 35th ball he faced. Marshall Ayub cemented his end without taking any risk and tasted his first four on the 63rd delivery he received. The hosts posted their first hundred on board in the 25th over and saw the day off at 2-103 after the last ball of the next over was bowled. Mominul Haque was unbeaten for 77 off just 71 with 13 fours whereas Marshall Ayub was batting at 21 from 74 balls. The Black Caps still have an upper hand in the game by holding a lead of 366 runs but the Bengal Tiger batsmen are fighting well in the park. The pre – lunch session of the third day’s play will set the direction of the Test and the fate of the hosts will hang on their middle order batting.